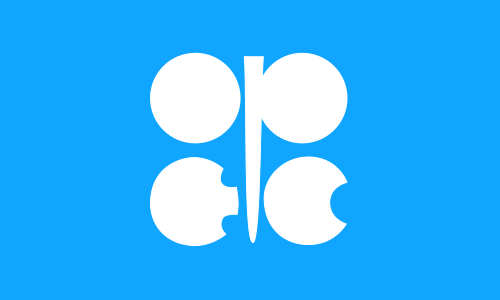 The Organization of the Petroleum Exporting Countries (OPEC, /ˈoʊpɛk/ OH-pek) is an intergovernmental organisation of 14 nations, founded in 1960 in Baghdad by the first five members (Iran, Iraq, Kuwait, Saudi Arabia, and Venezuela), and headquartered since 1965 in Vienna, Austria. As of September 2018, the then 14 member countries accounted for an estimated 44 percent of global oil production and 81.5 percent of the world's "proven" oil reserves, giving OPEC a major influence on global oil prices that were previously determined by the so called "Seven Sisters” grouping of multinational oil companies. In April 2001, OPEC collaborated with five other international organizations (APEC, Eurostat, IEA, OLADE, UNSD) to improve the availability and reliability of oil data. They launched the Joint Oil Data Exercise, which in 2005 was joined by IEF and renamed the Joint Organisations Data Initiative (JODI), covering more than 90 percent of the global oil market. GECF joined as an eighth partner in 2014, enabling JODI also to cover nearly 90 percent of the global market for natural gas. ^ a b "Europe Brent Crude Oil Spot Price FOB (DOE)". Quandl. Retrieved 1 January 2016. The 1980s oil glut was a serious surplus of crude oil caused by falling demand following the 1970s energy crisis. The world price of oil had peaked in 1980 at over US$35 per barrel (equivalent to $106 per barrel in 2008 dollars, when adjusted for inflation); it fell in 1986 from $27 to below $10 ($62 to $23 in 2008 dollars). The glut began in the early 1980s as a result of slowed economic activity in industrial countries due to the crises of the 1970s, especially in 1973 and 1979, and the energy conservation spurred by high fuel prices. The inflation-adjusted real 2004 dollar value of oil fell from an average of $78.2 in 1981 to an average of $26.8 per barrel in 1986.In June 1981, The New York Times proclaimed that an "oil glut" had arrived and Time Magazine stated that "the world temporarily floats in a glut of oil". However, The New York Times warned the next week that the word "glut" was misleading, and that temporary surpluses had brought down prices somewhat, but prices were still well above pre-energy crisis levels. This sentiment was echoed in November 1981, when the CEO of Exxon Corp also characterized the glut as a temporary surplus, and that the word "glut" was an example of "our American penchant for exaggerated language". He wrote that the main cause of the glut was declining consumption. In the United States, Europe, and Japan, oil consumption had fallen 13% from 1979 to 1981, "in part, in reaction to the very large increases in oil prices by the Organization of Petroleum Exporting Countries and other oil exporters", continuing a trend begun during the 1973 price increases.After 1980, reduced demand and increased production produced a glut on the world market. The result was a six-year decline in the price of oil, which reduced the price by half in 1986 alone. A benchmark crude or marker crude is a crude oil that serves as a reference price for buyers and sellers of crude oil. There are three primary benchmarks, West Texas Intermediate (WTI), Brent Blend, and Dubai Crude. Other well-known blends include the OPEC Reference Basket used by OPEC, Tapis Crude which is traded in Singapore, Bonny Light used in Nigeria, Urals oil used in Russia and Mexico's Isthmus. Energy Intelligence Group publishes a handbook which identified 195 major crude streams or blends in its 2011 edition.Benchmarks are used because there are many different varieties and grades of crude oil. Using benchmarks makes referencing types of oil easier for sellers and buyers. In 2008, crude oil production in Venezuela was the tenth-highest in the world at 2,394,020 barrels per day (380,619 m3/d) and the country was also the eighth-largest net oil exporter in the world. Venezuela is a founding member of the Organization of the Petroleum Exporting Countries (OPEC). Below is a list with each Secretary General of the Organization of the Petroleum Exporting Countries (OPEC), based on the organization's official publications. The Secretary General is OPEC's chief executive officer. This is a list of countries by proven oil reserves. Proven reserves are those quantities of petroleum which, by analysis of geological and engineering data, can be estimated, with a high degree of confidence, to be commercially recoverable from a given date forward from known reservoirs and under current economic conditions. Some statistics on this page are disputed and controversial. Different sources (OPEC, CIA World Factbook, oil companies) give different figures. Some of the differences reflect different types of oil included. Different estimates may or may not include oil shale, mined oil sands or natural gas liquids. Because proven reserves include oil recoverable under current economic conditions, nations may see large increases in proven reserves when known, but previously uneconomic deposits become economic to develop. In this way, Canada's proven reserves increased suddenly in 2003 when the oil sands of Alberta were seen to be economically viable. Similarly, Venezuela's proven reserves jumped in the late 2000s when the heavy oil of the Orinoco was judged economic. The OPEC Fund for International Development (OFID) is the intergovernmental development finance institution established in 1976 by the Member States of the Organization of the Petroleum Exporting Countries (OPEC). OFID was conceived at the Conference of the Sovereigns and Heads of State of OPEC Member Countries, which was held in Algiers, Algeria, in March 1975. A Solemn Declaration of the Conference "reaffirmed the natural solidarity which unites OPEC countries with other developing countries in their struggle to overcome underdevelopment", and called for measures to strengthen cooperation between these countries.OFID's objective is to reinforce financial cooperation between OPEC Member Countries and other developing countries, by providing financial support to the latter for their socioeconomic development. The institution's central mission is to foster South-South Partnership with fellow developing countries worldwide with the aim of eradicating poverty. OFID's headquarters are located in Vienna, Austria. The current Director-General is Dr Abdulhamid Alkhalifa of Saudi Arabia. He assumed office as Director-General and Chief Executive Officer of OFID on November 1, 2018. The OPEC Reference Basket (ORB), also referred to as the OPEC Basket, is a weighted average of prices for petroleum blends produced by OPEC members. It is used as an important benchmark for crude oil prices. OPEC has often attempted to keep the price of the OPEC Basket between upper and lower limits, by increasing and decreasing production. This makes the measure important for market analysts. The OPEC Basket, including a mix of light and heavy crude oil products, is heavier than both Brent crude oil, and West Texas Intermediate crude oil. The total estimated amount of oil in an oil reservoir, including both producible and non-producible oil, is called oil in place. However, because of reservoir characteristics and limitations in petroleum extraction technologies, only a fraction of this oil can be brought to the surface, and it is only this producible fraction that is considered to be reserves. The ratio of reserves to the total amount of oil in a particular reservoir is called the recovery factor. Determining a recovery factor for a given field depends on several features of the operation, including method of oil recovery used and technological developments.Based on data from OPEC at the beginning of 2013 the highest proved oil reserves including non-conventional oil deposits are in Venezuela (20% of global reserves), Saudi Arabia (18% of global reserves), Canada (13% of global reserves), and Iran (9%).Because the geology of the subsurface cannot be examined directly, indirect techniques must be used to estimate the size and recoverability of the resource. While new technologies have increased the accuracy of these techniques, significant uncertainties still remain. In general, most early estimates of the reserves of an oil field are conservative and tend to grow with time. This phenomenon is called reserves growth.Many oil-producing nations do not reveal their reservoir engineering field data and instead provide unaudited claims for their oil reserves. The numbers disclosed by some national governments are suspected of being manipulated for political reasons. Rilwanu Lukman (26 August 1938 – 21 July 2014) was a Nigerian engineer who held several ministerial positions in the Nigerian Federal government before becoming Secretary General of OPEC (Organization of the Petroleum Exporting Countries) from 1 January 1995 to 31 December 2000. He died on 21 July 2014. On 18 December 2008, Lukman was appointed Minister of Petroleum Resources by Nigerian president Umaru Yar'Adua, holding office until March 2010.